We can remove carpet odors. Carpet odors originate from a variety of sources. These substances get into the piling and surface of your carpet. Most over-the-counter products don't break up these carpet odor sources. 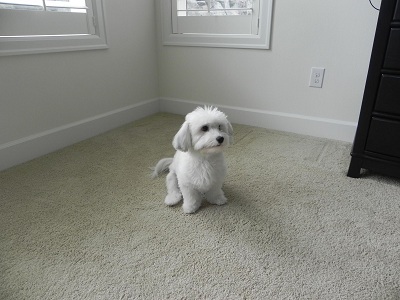 Pets are the most common sources for urine and feces in your carpet. Pet urine and feces contain odor that over-the-counter products usually don't break down. Typically these over the counter odor products will mask the odor and not remove the source. Food and liquid spills can build up over time. Since each food smells differently the odor combination can be unpleasant. This is compounded with multiple people spilling food and liquids throughout your carpet area. We will clean your entire carpet and typically this will help eliminate alot of the smell. Strong odors from cooking and smoking can settle into your carpets. If you experience odors from people smoking in your home or a rental property. We can come in and fog out the odors and our dry fogging process can eliminate the unpleasant odors from smoke or cigar smokers. Our primary purpose for any of our customers is to eliminate the source. Once we elimate the source of your odor we then can make your room or property fresh smelling again. Odors from fried foods can stay in your home for 1-3 days. Eventually these food particles settle into your carpets and on your tiled floors.